Reuniting lost dogs with their owners or adopting an unclaimed dog has been made easier with the introduction of online request forms. If your pet has wandered from home, visit the City of Wanneroo website to see all dogs that have been brought in to the Animal Care Centre. If you believe your dog is at the Centre, you can click the ‘I believe this is my dog’ button and start the simple process to reclaim your dog. While people have been able to adopt unclaimed dogs from the City of Wanneroo’s Animal Care Centre for many years, the initial application can now be made online, making the process much simpler. Once a dog becomes available for adoption (unclaimed for seven days and meets temperament tests) applications will be assessed and you may be contacted to arrange an appointment time to view the dog. If you have other animals or children you may be asked to bring them along with you. 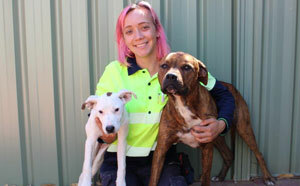 Director Community and Place Debbie Terelinck said staff in the Animal Care Centre cared about each dog as if they were their own, so every effort is made to ensure dogs are placed in the most suitable home. “Filling out an online dog adoption request form is more of an expression of interest,” Ms Terelinck said. “It gets people to think about what they want from a dog, and gives our staff the information they need about a potential owner and their home. For more information on adopting a dog and the fees involved please visit our Find a Pet webpage.